HP’s new ink manufacturing plant in Israel HP today has announced the opening of an 11,000-square-metre ink manufacturing plant in Kiryat Gat, Israel. 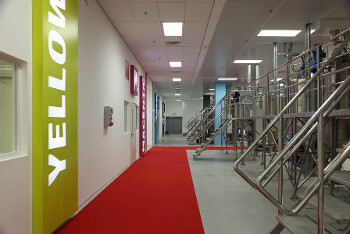 The facility has been built to produce ink for the new generation of HP Indigo Digital Presses announced in May. The company said that its HP Indigo Division is expanding its facilities in Israel to cater for strong growth, the result of an accelerating market transformation from analogue to digital printing. HP Indigo reported record revenue in Q4 FY2012 and increased quarterly page volume by about 20 per cent over the previous year. It added that its share of the worldwide commercial press market had increased by 13 points year-over-year to 71 per cent. The new HP Indigo plant is the first industrial building in Israel and first HP manufacturing facility worldwide which has been built to Leadership in Energy and Environmental Design (LEED) standards. Central to the design was to achieve a high performance in sustainable site development, water savings, energy efficiency, materials selection, and indoor environmental quality. LEED Certification is a leading global standard for buildings that are efficient, cost-effective, and better for occupants and the environment. The new HP Indigo’s Kiryat Gat campus now includes 56,000 square metres of building space and has been constructed to allow it to expand for future growth. The site also serves as the centre for training and for final application testing and qualification of each press before shipment. HP Indigo also has a manufacturing facility in Singapore. Inks produced at the new plant will begin shipping with the HP Indigo 10000 Digital Press. HP are marketing this as the first offset-quality digital press in a larger format (29.5 x 20.9 inches) suitable for printing nearly any size commercial job. It has completed early installations of the press at customer sites in the United States, Europe and Middle East, with general commercial availability scheduled for the spring of 2013.